The particle Xi CC ++ is a type of baryon – a subatomic particle consisting of quarks. Protons and neutrons are types of baryons that most of us will be familiar with. All of these particles are made up of a combination of three quarks. So far, six different types, or flavors, of quarks have been discovered, these being up, down, strange, charm, top and bottom. 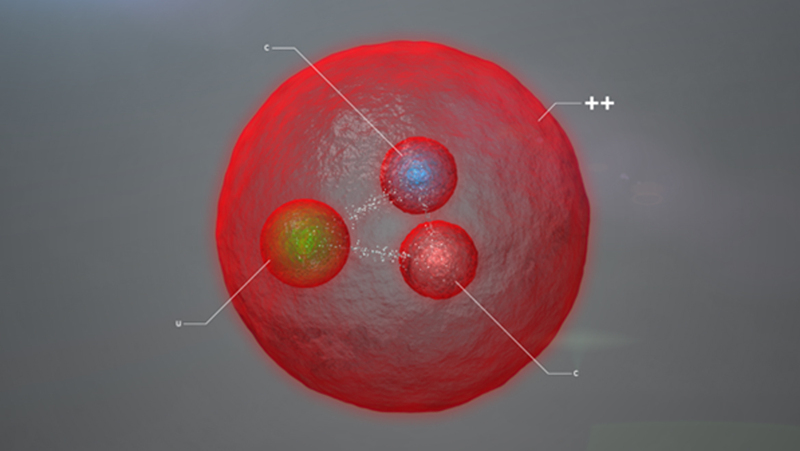 What’s interesting about the newly discovered particle Xi CC ++ is that it’s the first discovered to contain a combination of two heavy charm quarks and one up quark. This combination is fundamentally different to the majority of baryons due to the fact that it is thought that the two heavier charm quarks are located in the centre of the particle, whilst being orbited by the lighter up quark. Usually, all the quarks in a baryon orbit each other equally. The discovery has been reported in a paper titled ‘Observation of the doubly charmed baryon Xi CC ++’, published in the journal Physical Review Letters. It was also announced at the European Physical Society Conference on High Energy Physics, held in Venice, Italy. Guy Wilkinson who was involved in the discovery, also stated that "People have looked for it for a long time. It gives us a very unique and interesting laboratory to give us an interesting new angle on the behavior of the strong interaction (between particles), which is one of the key forces in nature." A reported by the New Scientist, the discovery of Xi CC ++ has been rated with a statistical significance of 7 sigma, suggesting a high level of confidence, as any finding over 5 sigma is considered as a firm discovery. Now, physicists at CERN and the Large Hadron Collider will be working more with this charming new particle to further our knowledge of exactly how baryons are formed and the ways in which the quarks within them are held together.